One of the greatest regrets of my youth is that I spent too much time thinking about a respectable career, and far too much time worrying about how to afford the education behind it. Had I followed my dreams and accepted student debt as the price of indulging my passions, I would have become an archaeologist. While I vividly remember my first adventures with Indiana Jones, Amelia Peabody and Dirk Pitt, what I remember even more is a warm April afternoon wandering a Grassy Brook creek bed . . . and finding a native arrowhead. There I stood, a stone's throw from all the gaudy trappings of modern Niagara Falls, holding in my hand something that was hundreds of years old. It was exhilarating, and it inspired me in a way that nothing else ever has. I missed my chance to pursue it as a career, but stories of archaeologists, treasure hunters, and tomb raiders have always been a cornerstone of my library. I know better than most how cheesy and irresponsible they are, but I still love the thrill of discovering history within those stories. 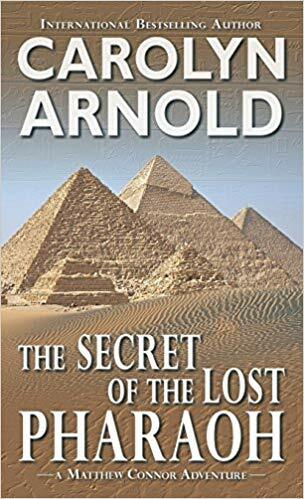 When an author blends respectable archaeology with the adventure, I am quick to take notice - and that is the first thing that struck me about The Secret of the Lost Pharaoh by Carolyn Arnold. This was a solid read that engaged me from the start. 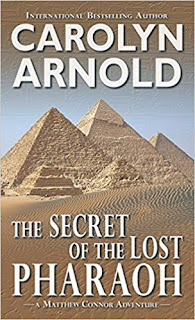 Unlike so many books within the genre, Arnold doesn't simply use an archaeological MacGuffin to spark a tale of international intrigue. Instead, archaeology is the foundation of the tale, and a continued focus throughout. Dr. Alexandria Leonard (Alex) indulges us in exhausting excavations and the painstaking cataloguing of artifacts; she cautions against touching items or disturbing their position; and she is aghast at the idea of removing even a few stones from a tomb wall, being more concerned with preservation of the tomb than escape from it. There is nothing reckless about the story - even the villains take proper archaeological precautions (for the most part). Nicely paced, with plenty of action and adventure, the story here is fantastic. The opening scenes deep inside the tomb, with the tunnel collapse, the long swim, the snakes, and the discovery of a lost tomb that they may not survive to share with the world, were perfectly orchestrated. There are some nice hieroglyphic puzzles and legendary mysteries, and the even if the climax felt a little rushed, it was thoroughly entertaining. I did feel the drama was a little thick at times, with love triangles and strained relationships leading to far too much moping about and fretting over things. That said, however, I did appreciate that the characters felt real, with lives outside the story and personalities that were more than just their careers. I was a little disappointed that I identified the two main villains right away, but I though Arnold did a stellar job of ensuring I remained unsure about Alex throughout. What's more, now that I've had the chance to meet Matthew, Robyn, and Cal, I've already ordered a copy of City of Gold so I can see where it all began. I was always interested in dinosaurs, natural disasters, volcanoes and sharks-I always regret not going into something connected with one of these things rather than the dead end jobs I ended up in! If I was at school now I could research possible jobs on the internet and my life might have been different! But when I was at school there was no internet and a careers officer that was obsessed with giving out leaflets on catering!